Well, I broke down and convinced my husband I needed a trip to the store on the way home from picking him up. I was able to try on (and subsequently buy ;p) the newest Lilac Inspire Pullover. I tried it on in store and was amazed that it actually felt much, much softer. Someone please confirm this for me. It feels like a thinner luon then the first batch of pullovers which makes those grosgrain cotton ribbon seams seem much less noticeable and bunchy. Also, a miracle happened. That back zippered pocket has been repaired. As you can see from the picture bellow, the first Inspire Pullover on the left has a scratchy zipper not sewn all the way in and the one on the right is sewn right to the end of the zipper. I suspect some who purchased the first batch and didn’t notice a problem with it had theirs sewn in and finished off properly. I plan on taking my first Inspire Pullover in to the store to see about getting it fixed. This new pullover feels perfect and I absolutely love it now. This is what the Inspire Pullover should have been on first release. 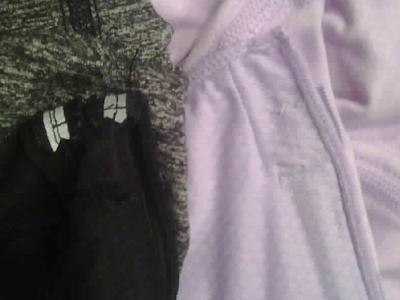 "New Photos of Inspire Pullover, Power Dance Tank, Heart Tank, Run: Dash Pants, Belt it Out Pants..and New Lilac Stide"
"New and Improved Modern Crew Necks"